TORONTO — Through thumb prints of their "buzzer fingers," a video compilation and multimedia scrapbook, former "Jeopardy!" contestants are creating mass tributes for Canadian host Alex Trebek, who announced Wednesday that he's battling Stage 4 pancreatic cancer. Sally Neumann, a mental-health counsellor in Seattle who competed on the hit quiz show in March 2016, said Thursday she's spearheading the projects through a secret "Jeopardy!" contestants Facebook group that has thousands of members. "I spend a lot of time doing grief counselling for kids in an artistic medium, so I suggested everybody mail me their buzzer fingers — their thumb prints in the mail in various colours in ink — and I'm going to cut them up and make it into a collage of the buzzer fingers and send it to him," Neumann said in a phone interview. "It's like we're buzzing in one last time, giving him a thumbs up, imbuing the piece of art with all of our touch and gratitude." Another former contestant is in charge of the multimedia scrapbook, while two others are editing the video compilation, Neumann added. They're among a slew of "Jeopardy!" fans and contestants expressing support for Trebek and applauding the way he announced his diagnosis through a YouTube video, in which he stoically vowed to continue working and "beat the low survival rate statistics for this disease." Standing on the show's set in a suit, the Sudbury, Ont., native even joked that he had to win the battle and stay on the job because he still has three more years on his "Jeopardy!" contract. The video perfectly encapsulates the unflappable and genial persona of the perennial quiz-show host, say many contestants, who describe him as being just as warm, intelligent and personable behind the scenes as he is on TV. "I thought that was just so fitting and so moving and so him," said Ben Merritt, a consultant from Dallas-Fort Worth, Texas, who was on "Jeopardy!" in 2000. "He's very direct, he's going to tell you the situation, 'Here's what I'm going to do and you guys are going to help me.' ... It's classic Alex." The video was "really classy," added Emma Badame, a Toronto digital marketing manager who was a competitor on the show in February in a pre-taped segment that will air later this month. "The calmness and the confidence in delivering the message was really, really impressive. I could never do that. I'd be a mess." Neumann said she saw others posting about the video but found it too emotionally difficult to watch herself. She felt it was brave and kind of him to announce something so personal to everyone. "It was really acknowledging how much he realizes what an impact he's had on everybody," she said. "Jeopardy!" tapes five shows in a row, two days a week in California. 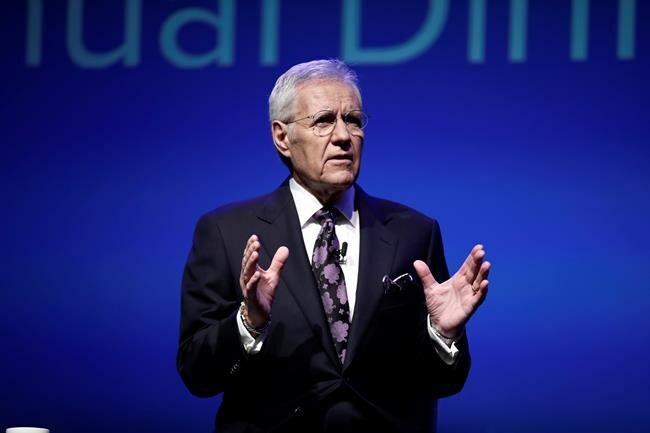 Contestants say Trebek, who has been hosting since 1984, doesn't have much more interaction with them beyond what is seen in the show, due to reasons of integrity and the enforcement of standards and practices. But he is given five talking points about each contestant, studies those hard and makes the most of his brief one-on-one chats with them. Merritt recalled Trebek asking him on the show about a baseball he has that's signed by many star players. Trebek blew him away with his insight into the sport. "He's so knowledgeable about everything," Merritt said. "I'm sure he makes everybody feel like he's an expert in their area of expertise, because he's just so well read and just so sharp." Snowden Becker, a March 2005 contestant from Los Angeles, said Trebek asked her about growing up on a clam farm in a bit that got a huge laugh from the audience. "He is so warm and engaging," said Becker, who is the program director for the master's degree in Library and Information Science at the University of California, Los Angeles. "He seems so genuine and I think he really likes people and people really like him as a result." Heather Cothran, a high school English teacher in St. Louis, Mo., who competed on the show in 2007, said Trebek is also great with the audience. "At the end when you watch the show, you'll see people standing around there and he does talk to you when you're standing there," Cothran said. "I found him very personable and warm." Trebek is also just as sharp as many of the show's participants, they say, noting he's a master of pronunciations and languages. "He seems like he would probably do pretty good on the show as a contestant," said Cothran. "He's just been the face of it for so long. When I was there in person, he was the consummate professional, just really good at his job — very quick-witted, very personable, very outgoing. Just everything you would want a good game-show host to be, basically."